Here we go again: another weekend, another cake for my summer baking project. 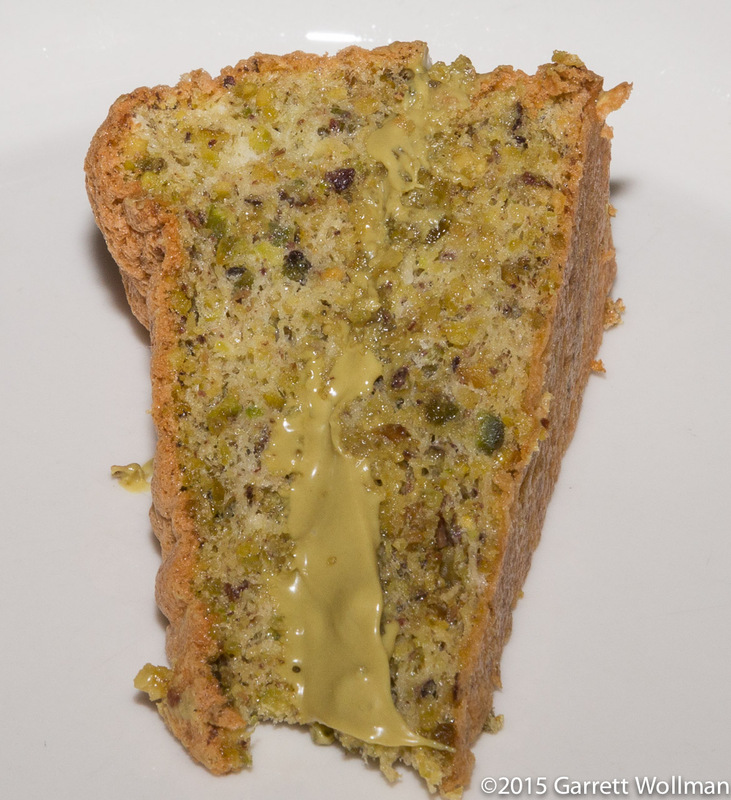 This time, it’s “Torta di Pistacchio” from Rosetta Costantino’s Southern Italian Desserts (Ten Speed Press, 2013; p. 46). Per the headnote, this recipe is a direct substitution of pistachios for walnuts in the walnut cake from Costantino’s My Calabria ; it’s made by the soufflé method, and (like a number of Costantino’s cakes) has a very short and simple ingredient list — it was quite easy to make. 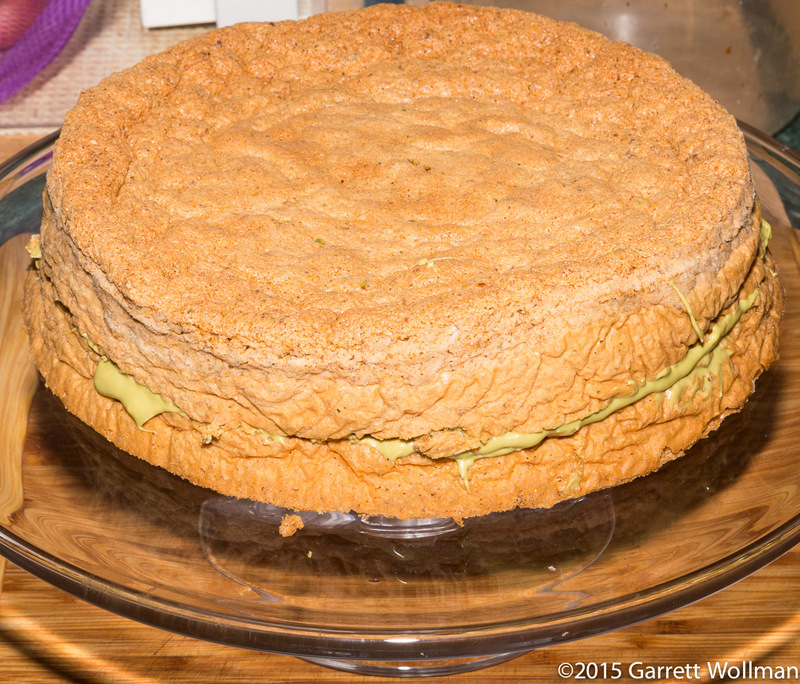 I’m eager to try the walnut version of this cake as well, but probably not until next year. Torta di Pistacchio has just five ingredients, four of which are seen here (there’s only a pinch of salt so I didn’t pre-measure it). From the lemon, only the zest is used. An optional addition is the Sicilian crema di pistacchio, in the 180 g bottle at lower right. 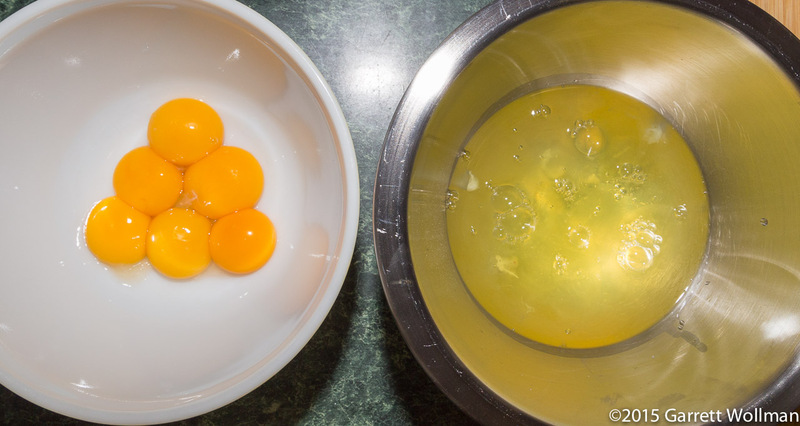 All six eggs are successfully separated. 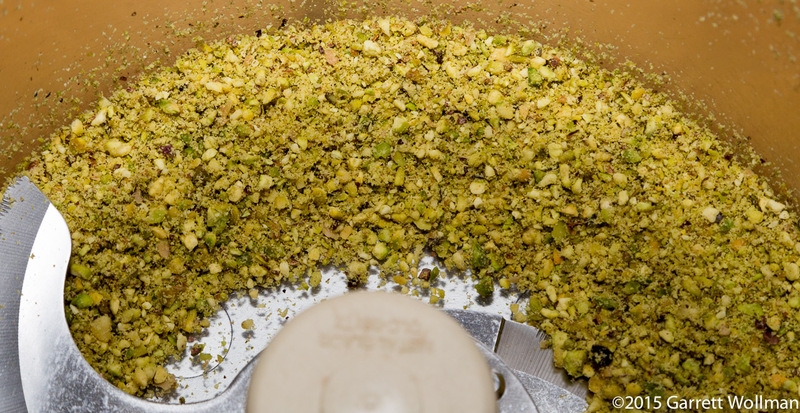 Nearly all of the flavor in this recipe comes from the pistachios, which are supposed to be ground to the texture of cornmeal in the food processor. I’m not sure this is really as fine as it should have been, despite being processed in two batches, but my processor really didn’t go any finer than this. 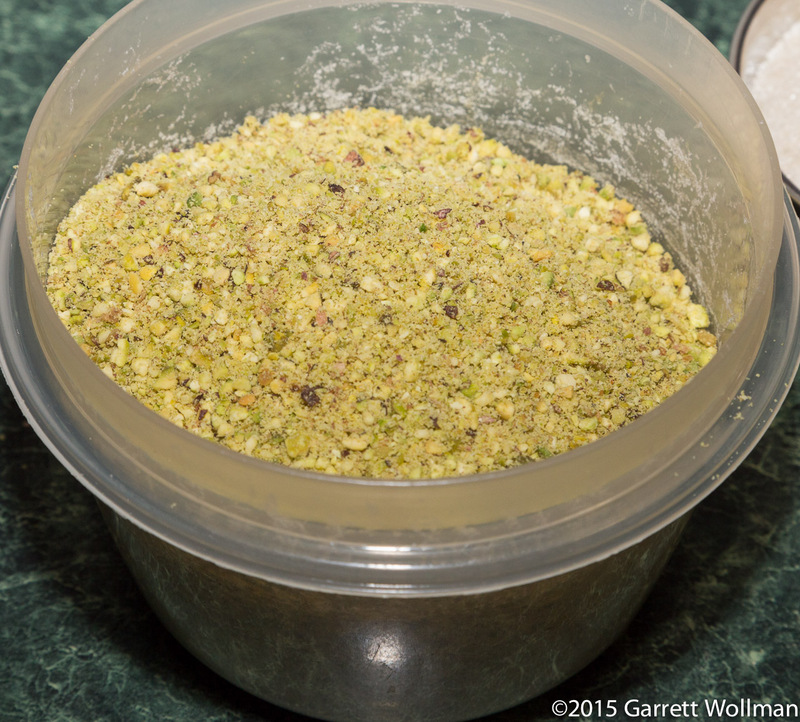 This is the whole half-pound (225 g) of ground pistachios, set aside while we whip the eggs. 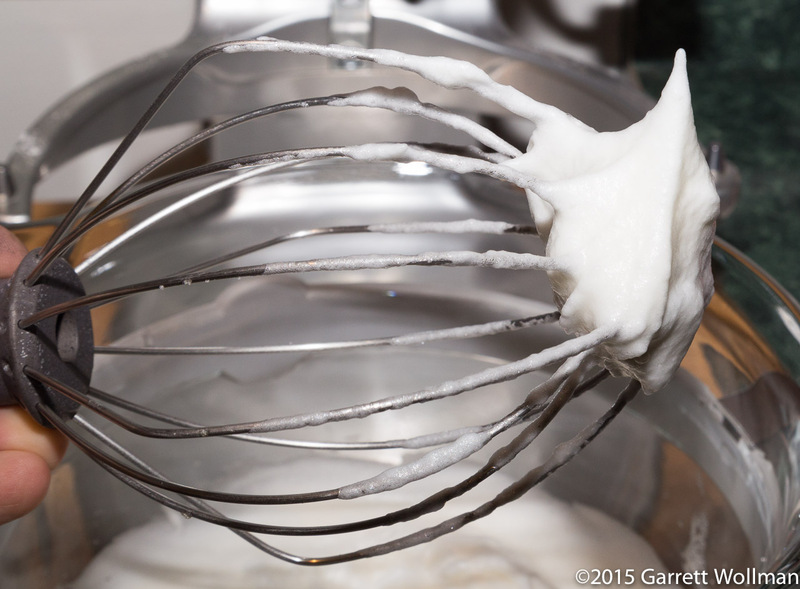 Next step is to make a meringue from the egg whites, a pinch of salt, and half (75 g) of the sugar. Costantino specifies “medium-firm peaks … that are not at all dry”; as before, I don’t quite understand what that means, but I think this is pretty close. 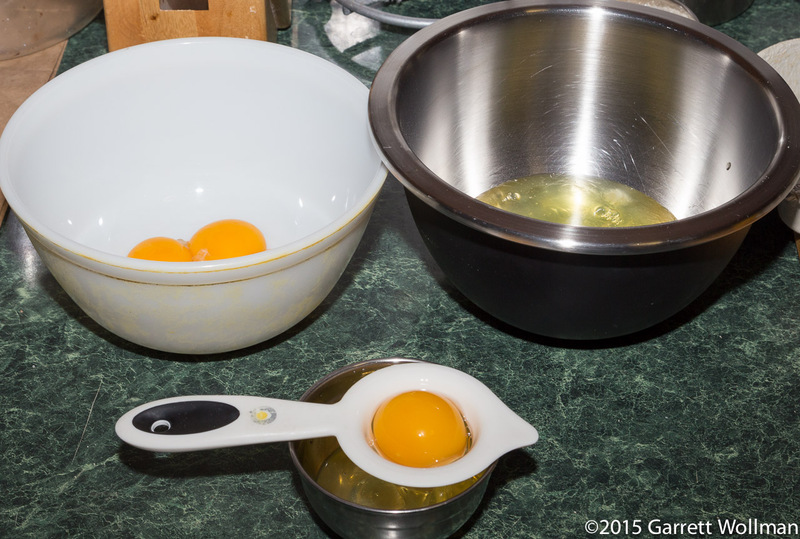 The egg yolks are beaten with the other half of the sugar to the ribbon stage, and then the lemon zest is mixed in. 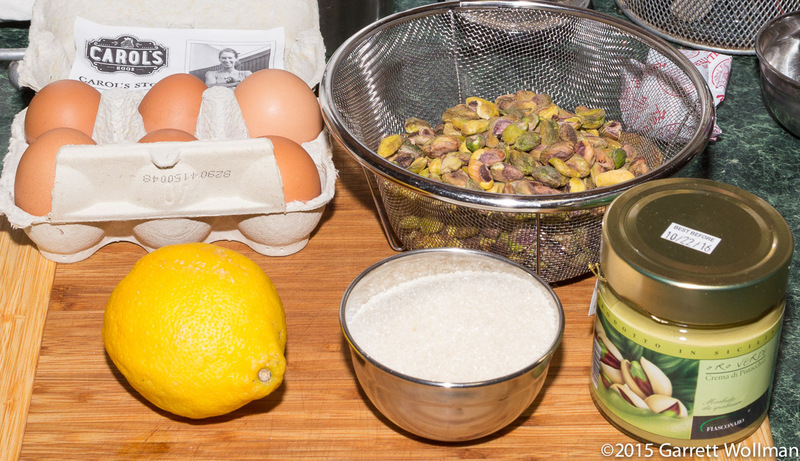 The egg-yolk mixture is folded into the meringue, followed by the ground pistachios, the latter being added by thirds. 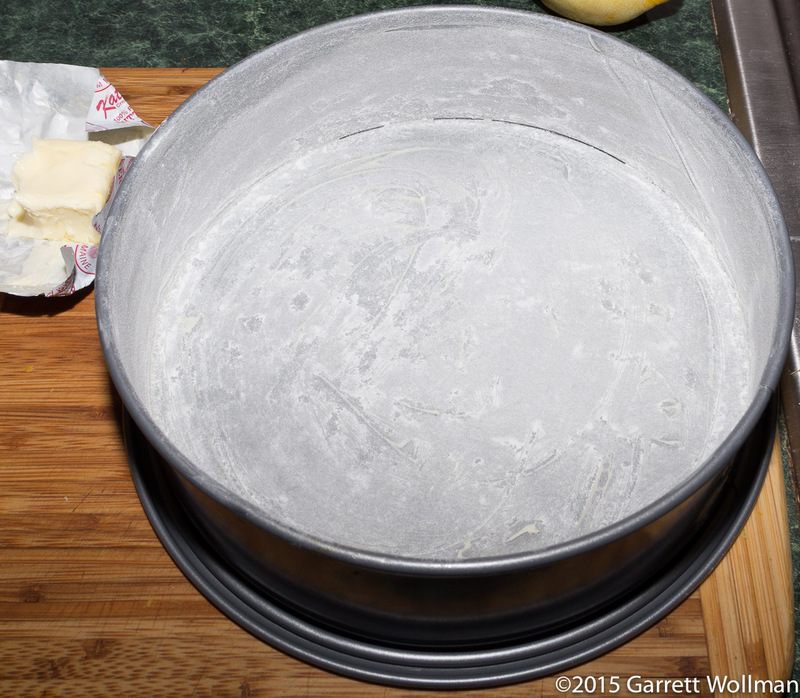 The batter is then carefully poured into the prepared springform pan and baked at 325°F (160°C) for 35–40 minutes (Costantino says “about 40 minutes” here; I tested with a skewer after 35 minutes and found that the cake was already done). The cake must then cool in the pan for about 20 minutes before releasing the springform, at which point it should be allowed to cool completely. When the time came, I had to use a paring knife to release the cake, which was stuck to the side at one spot. 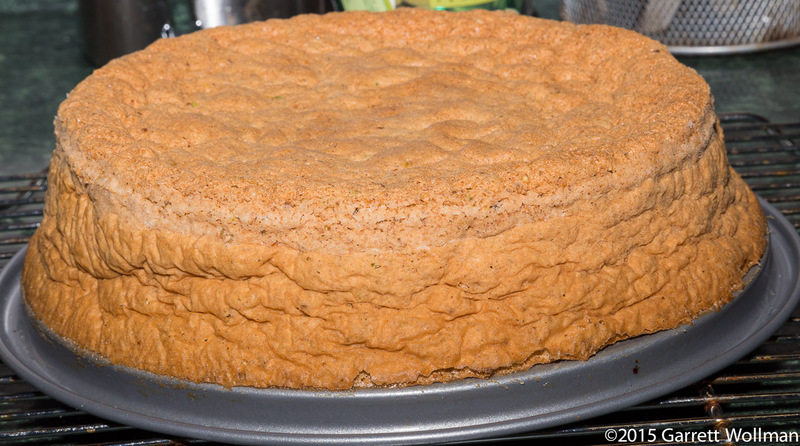 After cooling, the cake has slumped a little bit; it’s also clear that my oven rack is not entirely level. But since this is not a fancy cake, I’m not too concerned by these defects. 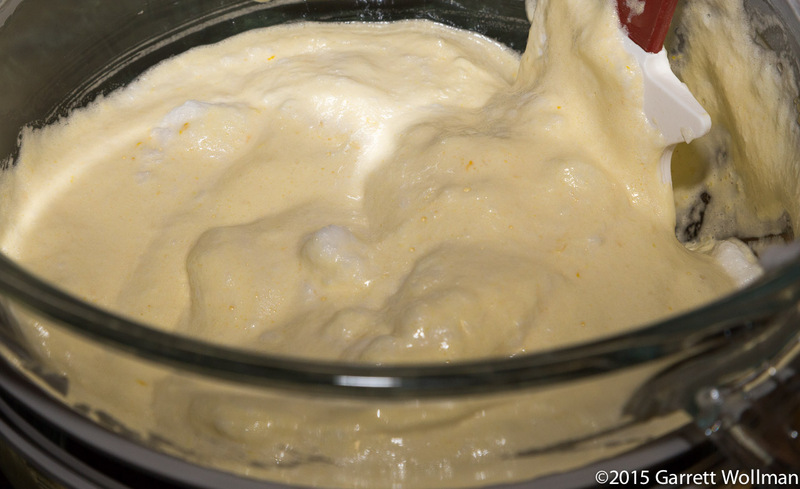 Despite being made like a soufflé it hasn’t fallen quite so much in the center as a soufflé would, since it has been allowed to cook all the way through, giving the protein network of the two egg foams a chance to solidify. 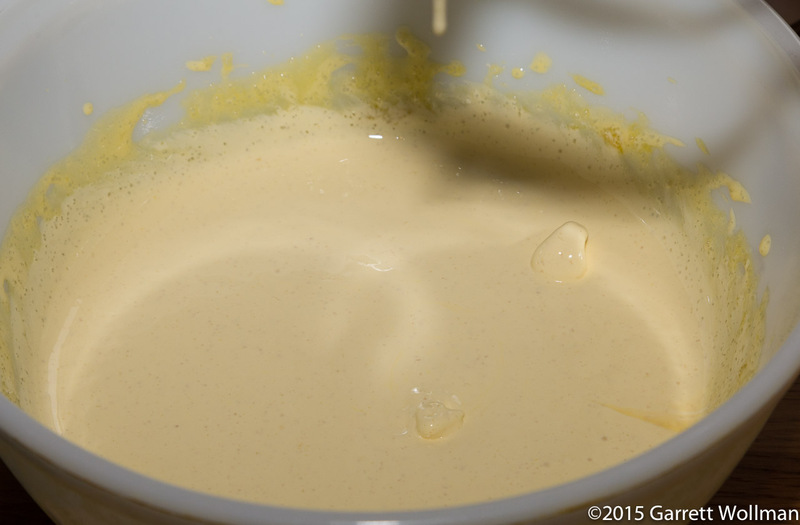 Having applied the crema di pistacchio — the whole bottle, 180 g — I put the top of the cake back on. (I should have made a small witness mark so I could line the top and bottom up properly. Oops again.) Costantino suggests serving with a dusting of confectioner’s sugar, but that needs to be applied immediately before service: if allowed to sit overnight, it would get gummy and nasty. The cake is not refrigerated: it’s not necessary for this length of storage, and the crema di pistacchio label specifically says not to refrigerate it. I partially portioned the cake so I could photograph a single slice (again, without the recommended confectioner’s sugar), since none of this cake will be returning from the office on Monday. Pistachios sure are green, aren’t they? Everyone at the office seems to have quite liked it — particularly the pistachio lovers. With only twelve slices, it was gone pretty quickly. Costantino’s recipe gives a yield of eight servings. I felt that this was probably too large, and calculated the nutrition for twelve servings instead. This is based on using a whole jar of “Oro Verde” brand crema di pistacchio as filling and a tablespoon of confectioner’s sugar as decoration. 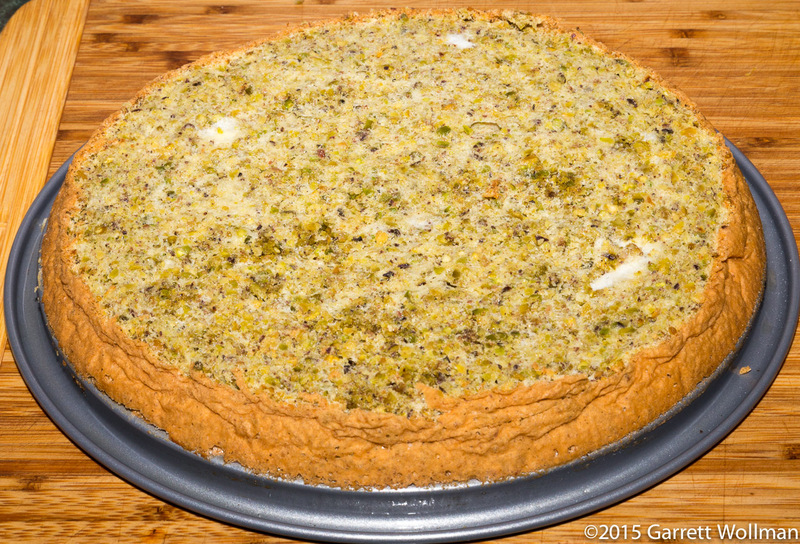 Gallery | This entry was posted in Food and tagged cake, eggs, pistachios, recipe, Rosetta Costantino. Bookmark the permalink.